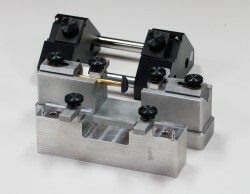 The Deluxe Transfer Fixture is a precise alignment instrument for the accurate transfer of stones. The deluxe three post model is used to facilitate centering of the stone during transfer. The fixture utilizes the alignment keyways in the Precision dops to insure an accurate transfer.